Free and everyone interested is welcome. 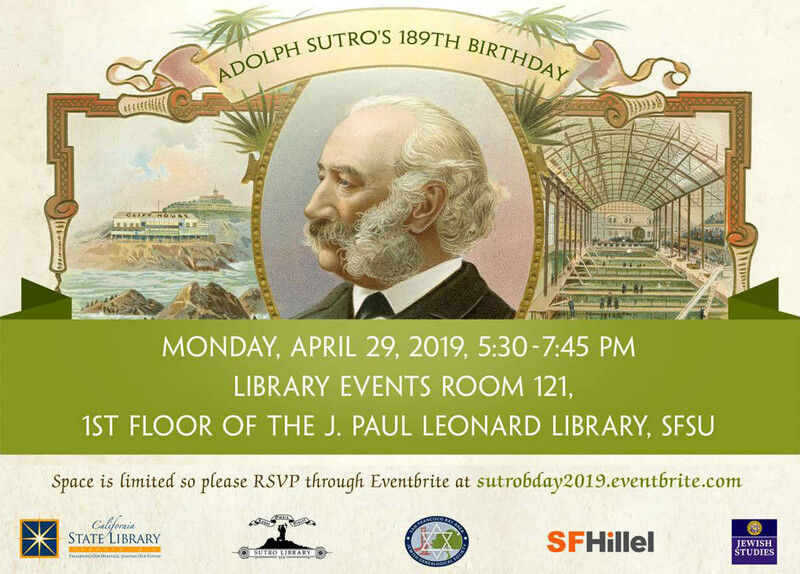 American Jewish Life on the Edge (of the Continent): Jews and the History of San Francisco"
Birthday treats and refreshments will be provided. Crista will talk about the Jewish records collections on Ancestry, as well as some search tips and tricks during this presentation. Bring your problems, questions, and documents (copies, please, no originals), and a panel of experienced researchers will brainstorm to provide information and suggestions that will show your next steps and may help you solve some of your family mysteries. Parking Information: Rhoda Goldman Plaza has a private, locked garage on Sutter, between Pierce and Scott. It is in the middle of the block and large writing on the building says "Parking for Rhoda Goldman Plaza". Pull up to the gate, press the RGP button on the box on the driver's side, say you are there for the genealogy society meeting, and the gate will be opened. Then drive down the ramp to RGP's visitor parking. Take the RGP elevator to the first floor, then make a right and a quick left turn, and walk down the hallway to the lobby. There you register and the front desk staff will direct you to the Olive Room on the same floor. You've done the research, gathered facts and photos, and created a family tree. This session will explore how to bring these fragments together through the creation of compelling narratives. These narratives can take various forms, including profiles of particular ancestors, accounts of your family's life before they came to America, remembrances of family members who died in the Holocaust, stories you heard about the lives of the first generation to settle in America, and success stories documenting your path to solving family mysteries and discovering your roots. Since 2009, Nancy Siegel has edited the JewishGen Success! Stories publication, part of JewishGen's educational outreach. These stories showcase the many resources of JewishGen and inspire as well as inform those who read them. Nancy also prepares the Research Notes and Hints at the end of every story to highlight the resources used by the authors in achieving their success as well as to list other avenues of research that could be helpful to readers. Pay it forward, fellow genealogists! Indexing is the result of volunteers reading images of old records and typing the information into a searchable format. SFBAJGS has taken on the task of creating an index for Jewish records from the San Francisco Bay area. So we need REAL PEOPLE to read the records and type the information into Excel spreadsheets. We will provide extra special refreshments, computers, and instruction on this valuable and essential service. Mac and PC people are both welcome! If you can't stay for the whole afternoon, we will be happy to have you for as long as you can help, for an hour or more. Don't miss this opportunity to make more records accessible to genealogists around the world and meet others with similar interests! We would like to have an idea of how many people will be coming (so we can buy the right amount of food! ), so please RSVP via email to transcriptions@sfbajgs.org. Labor Omnia Vitae: How Your Hard Work Can Conquer All at the Sutro Library, Dvorah Lewis Sutro Library, the California State Library branch located in San Francisco, has one of the largest genealogy collections west of Salt Lake City. Sutro Library is not just a physical hub for the genealogy community, it is also a virtual hub. Come learn how to access Sutro Library's genealogical resources on site as well as online. Dvorah Lewis has been the Genealogy Librarian at Sutro Library for two years now. She earned her Bachelor’s degree in English with a minor in Jewish Studies at UC Irvine and earned her Master's (MLIS) at UCLA. Her passion for archives and genealogy was inspired by an interview with her great Aunt Essie, the then eldest member of her family. She is excited to help genealogy researchers learn how to navigate the State Library’s extraordinary collections and resources. Dvorah feels that by preserving the past we can understand the present and bring positive change to the future. She is a board member of SFBAJGS. We are used to looking for our ancestors in passenger lists and in census records. We have mastered a variety of tricks for finding people in spite of name misspellings and incorrect birthdates. You might think that U.S. presidents are a breed apart from our ancestors, but they are not. They also arrived on ships and have come face to face with the census taker. This talk will show you how to search for presidential records, and you will see that it is no different than searching for ancestral records. We will encounter some of the same problems with both searches, and we'll see how these problems can be solved. Steve Morse is the creator of the One-Step Website, for which he has received both the Lifetime Achievement Award and the Outstanding Contribution Award from IAJGS, the Award of Merit from the National Genealogical Society, the first ever Excellence Award from the Association of Professional Genealogists, and two awards that he cannot pronounce from Polish genealogical societies. In his other life Morse is a computer professional with a doctorate degree in electrical engineering. He has held various research, development, and teaching positions, authored numerous technical papers, and written four textbooks and holds four patents. Everyone has brick walls in their genealogy research. People who appear to have been dropped out of the sky. Women whose maiden names seem to be unknowable. Cluster research will give you new avenues break down those brick walls by researching their family members, their neighbors and anyone and everyone they were associated with. Explore methodologies that will help you uncover new information about your family. Anne Gillespie Mitchell has been chasing her ancestors up and down the Great Wagon road through Virginia, North Carolina, and South Carolina for many years. She currently works for Ancestry on a variety of products including search, Ancestry Library Edition, AncestryK12, and now RootsWeb. She has completed the Boston University Online Genealogy Certificate course as well as multiple sessions at SLIG and IGHR. She has also taught genealogy courses at many national conferences, including NGS, FGS, and RootsTech and at SLIG. Before Ancestry she worked in the Internet industry in software development and has been a product manager for several companies. She has a Master’s degree in Computer Science from Purdue University, where she also taught Computer Science for eight years. The 1940 U.S. census opened in 2012 without a name index. A FamilySearch-led consortium used 160,000 volunteers to create a name index for that census in five months. In addition, Steve Morse and Joel, over seven years with about 125 volunteers, developed free utilities to find which of 150,000 census districts someone was in when a location or address was known. These projects are examples of crowdsourcing. Steve and Joel are now doing a similar project for the 1950 census. Joel will discuss differences between the 1940 and 1950 censuses that had an impact on their planning and project designs. The film scanning, publicity, volunteer response, Yahoo Group site, cloud storage, software, One-Step utilities, and project phases will be discussed. All 233,800 1950 enumeration district definitions have now been transcribed. Street indices have also been completed for more than 2,400 communities to help find 1950 census district numbers. Original 1950 census documents will be displayed. Joel Weintraub is an emeritus Professor at California State University at Fullerton and was a volunteer for nine years at the National Archives branch in Laguna Niguel, California. For more than a decade, Joel has created search tools for the U.S. and New York City censuses that are freely available on the Steve Morse "One-Step" site. He has given presentations on censuses (both federal and New York City), immigration and naturalization, biographical, and Jewish genealogy topics and has published articles on many of those topics also.